At Grayhawk, real estate owners have the freedom to customize their lives. Nestled between its award-winning daily fee golf courses, Talon and Raptor, the Grayhawk community includes several of the Valley’s finest homebuilders specializing in single-family homes, townhomes, condominiums, luxury rentals, and custom home sites. Providing more than simply a place to live, Grayhawk also works to build a sense of community. With its exceptional amenities and services, including its two outstanding restaurants, Phil’s Grill and the Quill Creek Cafe, the nearby Grayhawk Clubhouse provides an ideal location for community get-togethers. Grayhawk residents also benefit from other community features such as 30 miles of hiking, biking and jogging trails as well as barbecue pavilions, tennis courts and neighborhood swimming pools. 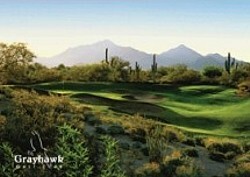 Grayhawk Golf Club is a public daily fee course in Scottsdale.